Production on Gareth Edwards’ reboot of Godzilla began last week, and there have already been location photos and videos leaking out of the Vancouver International Airport shooting location. 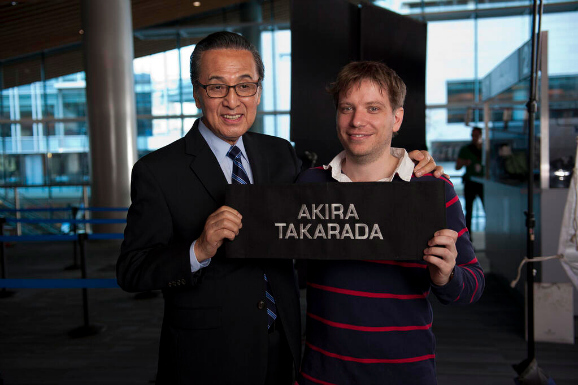 But as Gareth Edwards celebrates the first week of production on the monster movie, Legendary Pictures has released a new image of Edwards with the star of the original Japanese movie, Akira Takarada. Godzilla screenwriter and ex-Walking Dead showrunner Frank Darabont penned the final draft of the screenplay, which was previously worked on by writers Max Borenstein, Dave Callaham, David S. Goyer, and Drew Pearce. The Godzilla reboot film will feature actors Aaron Taylor-Johnson, Elizabeth Olsen, Juliette Binoche, Ken Watanabe, David Strathairn, and Bryan Cranston. 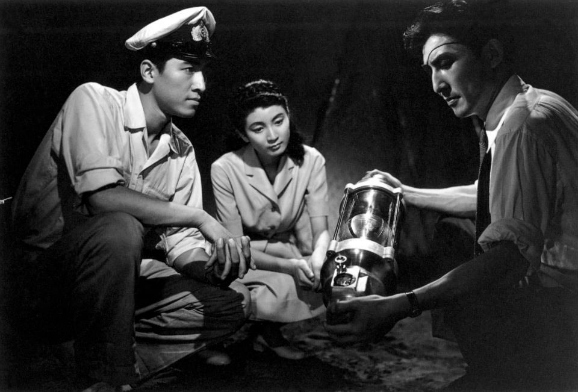 Godzilla will stomp into theaters on May 16, 2014, in 3D.